Punch Armor is a punch coating available exclusively from American Punch. Developed from many years of research, this multi-layer coating surpasses other Physical Vapor Deposition (PVD) products such as Titanium Nitride (TiN) and Chromium Nitride (CrN). Punch Armor is a 0.0001 to 0.0002” thick, wear-resistant punch coating that increases surface hardness, improves wear, and greatly reduces adhesive surface buildup (galling). Punch Armor gives you the best opportunity to significantly extend tool life. 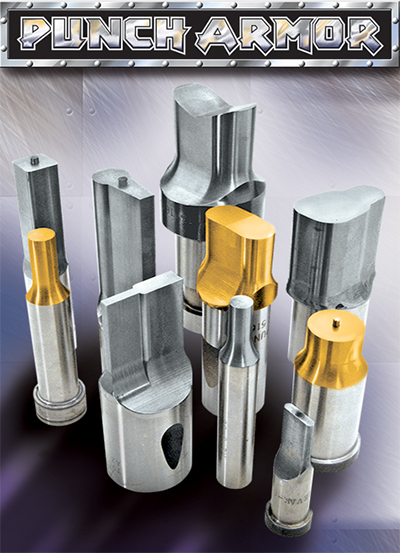 For applications that still require a TiN wear-resistant coating, we offer our Punch Armor Gold, an improved formulation of Titanium Nitride. Gold in color, it is more durable and has outperformed other TiN coatings in similar applications. Punch Armor and Punch Armor Gold both have base material requirements. Please contact our sales department at 1.800.243.1492 for details.